With all the kitchen sink debris that goes down the drain, it should be no surprise that your garbage disposal sometimes gets a little smelly and needs some extra cleaning. Using common household items from your kitchen or medicine cabinet, you can easily clean your garbage disposal in ten minutes or less using one of the following six DIY methods listed below. If you already have ice cubes in the freezer, pour two cups ice cubes down the drain, followed by one cup rock salt and run the garbage disposal, followed by 5 to 10 seconds of cold running water. For another potent deodorizing and cleaning method, you can also make ice cubes out of distilled white vinegar and pour that down the garbage drain as well. 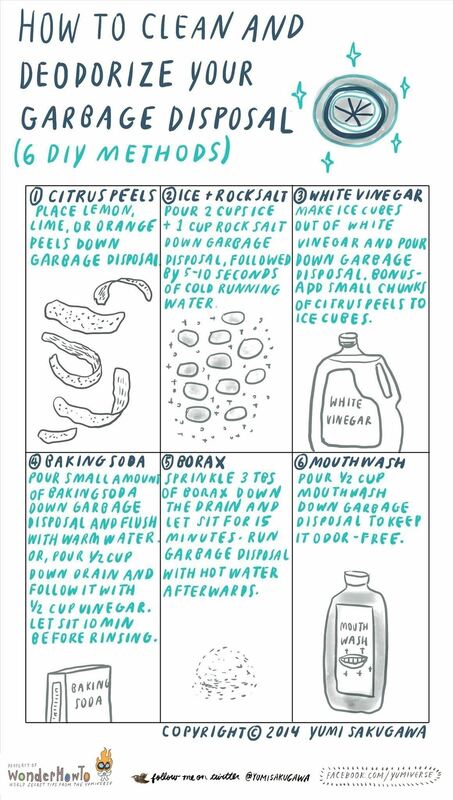 Other methods include citrus peels, baking soda and vinegar, Borax, and mouthwash. News: Cheap and Easy Blinds that Look Good!